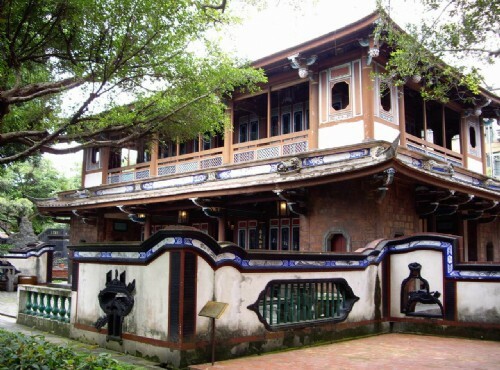 Lin Family Garden is ranked as a class two historical site in Taiwan.Located in Banciao, New Taipei City (Taipei County), Lin Family Garden is said to best represent the style from southern China in its architecture. Lin Family Garden is now open for touring and is a great way to learn more about the history of the time. The Lin Family used to be one of the most powerful and influential families in Taiwan, they played an important role in the Taiwanese society during their lifetime. The Lin family started their agriculture business in rice, tea, and camphor, and had owned the largest area of land in Taiwan. The Lin Family continued to expand their business and ended up becoming the richest family in Taiwan. They are not only succeeded in their business, but also participated in the development of Taiwan economic infrastructure. They were one of the main planners of some major cities in Taiwan. For more information on Lin Family Garden, please visit http://en.linfamily.tpc.gov.tw/_file/1376/SG/23225/D.html. Located in Banqiao, New Taipei City (Taipei County), Lin Family Garden is an important historical site representing the horticulture and gardening cultures of Taiwan. With massive detailed works and designs, the beautiful garden was not fully established until 1893. Group guided tours (15-20 people, in English or Japanese)Reservation one week in advance is required. 1. National number 1 highway(國道一號), exit Wugu offramp(五股交流道), connect to Tai 2 route(台2線), turn right on Siyuan Rd(思源路), towards Dahan bridge(大漢橋), turn right on Wenhua Rd(文化路), along Minchuan Rd(民權路), Gonguan Rd(公館路) and Ximen Street(西門街) to reach. 2. National number 2 highway, exit Banciao offramp, along Wenhua Rd(文化路), along Minchuan Rd(民權路), Gonguan Rd(公館路) and Ximen Street(西門街) to reach. 1. From Taipei City, take bus route 264, 307, 701, 702 to Lin Family Garden stop(林家花園站) to reach. 1. Exit New Banciao Station(板橋新站), walk along Ximen Street(西門街) to reach. 1. Take MRT Bannan line(板南線捷運), exit Xinpu station number 1 exit(新埔站出1號出口), transfer to bus route Blue 16(藍16) to reach.